The 10 days Combined Annual Training Camp of NCC inaugurated today with participation of more than 500 cadets at Rajiv Gandhi Government Polytechnic today. Inaugurating the Training camp Director (Higher & Technical Education) as Dr. Tayek Talom said that one who joined NCC is binding with discipline, unity with commitment for national integration and self defence. Elaborating his association in NCC during student days Dr. Talom said that NCC is a principle of life with discipline and sincerity and commitment for patriotism. He said that two NCC cadets who have exhale in the performances have now got trained for two years from Air force and Navy and after their special training for next one year they will be getting themselves ready to serve the nation as flight officer and lieutenant which is a proud moment for us that the NCC have a potential for getting employment and the training once obtained sincerely from NCC never go waste. The A, B and C Certificate obtained after lots of training is also beneficial during the interview. He said that the NCC is 2nd line of defence and during emergency the NCC officers and cadets are called for service and not only the cadets are served during the natural calamity and serve as volunteers service to the humanity Dr. Talom said. He further appeal the cadets to be sincere, honest and patriot toward motherland and also concentrate in their academic activities apart of participating in NCC and other games and sports. Commanding Officer (AP Battalion, NCC) Lt. SM, Col, N. K. Bishnoi, Rajiv Gandhi Government Polytechnic (RGGP) Principal, A. K. Tripathy, RGGP, CTO Palvinder Singh among other address the gathering. 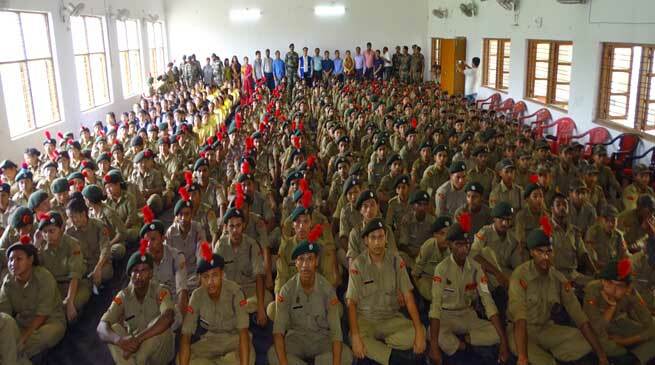 Cadets from AP Battalion, NCC, Naharlagun, 5 Assam Battalion, Tezpur, 8 Assam Battalion, Nagoan, 72 Assam Girls Company, North Lakhimpur, 73 Assam girls company, Tezpur and more than 500 cadets apart of officials from different schools and colleges and trainees from NCC and Army wings are participating the training which shall conclude on 22nd June 17.